Education support is an area that Apple has famously flubbed the last few years, from sacking the sales staff to introducing machines too late for the then-current buying cycle. This time, though, everyone’s favorite fruit company seems to be on-the-ball. 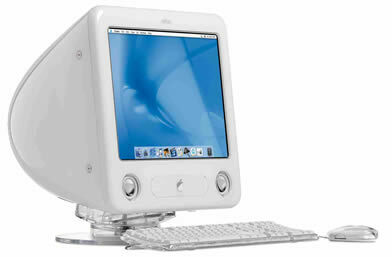 The eMac, introduced on April 29 alongside the new TiBook, is a machine purported to be designed specifically for the edu market. With a 17" flat-CRT monitor (16" viewable) and all the current interface ports, it’s a rev that brings the machine formerly known as iMac into the current motherboard age. Interestingly, Apple chose to rename this machine, probably to avoid product confusion and give Apple the opportunity to segregate the last of the CRT machines from the “general purpose” flat-panel lineup. This machine finally brings a G4-based machine into the Edu market (in terms of pricing). This allows Apple to continue to push hard with its concept of “multi-media learning”, by including (as it does on all new machines) the iSuite: iMovie, iPhoto, iTunes. Two FireWire ports make this a machine to connect multimedia gear like DV cameras and audio capture (although there is also analog audio capture on it). Even though Apple touts the ability to use most of a school’s existing hardware (like printers and scanners) in Mac OS X, the reality is that many drivers are still lacking. Perhaps that’s why Apple does offer its edu customers the option of ordering their new eMacs in default boot configurations for either 9 or X.
Oddly, the list of software packages included on the education Mac doesn’t seem to be all that instructional. From Apple’s spec sheet, QuickTime, iMovie 2, iPhoto, iTunes 2, AppleWorks, Mac OS X Mail, Microsoft Internet Explorer, EarthLink, AOL, World Book Mac OS X Edition, PCalc, Acrobat Reader, and FAXstf are all included. The World Book software seems to be the only real standout in this package that might be interesting to educators. What happened to the wealth of educational software that the Mac OS is famed for (even at the expense of other software categories)? Why doesn’t more get included? Too often education has to deal with last-year’s technology or the same machine everyone else does, just at a lower price. Apple’s improvements to the older iMac bode well both for Mac-based schools and Apple itself. Likely, many of the improvements in the eMac are based on existing motherboards for other models, giving the company room to navigate the price waters without having to sacrifice a teacher to the gods of price-margin. At the same time, stuffing a 17" CRT into the same space as the older 15" brings a better experience to the end-user. Touches like moving the serial number and hardware ethernet address to the front of the machine show that Apple really is listening to its customers (or at least thinking ahead). All in all, it seems a decent machine to bring the all-in-one CRT form factor into the G4 age.